I wanted soft lighting for my apartment deck at night instead of the stark electric deck light. So I came up with the idea of a hanging jar lantern. Two, three and more to come. You'll most likely have all the needed items already but, if you don't, none are expensive. I tried to make the hanger with just one piece of wire but it wasn't stable enough to keep the candle level. What I did was secure a wire under the lip part of the lid. Then threaded and secured one end of a longer wire through that first wire. Then chose the length for hanging, bent and secured the other end of the second wire to the opposite side of the first wire. 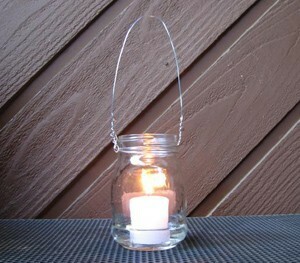 Place a bit of water in the bottom of the wired jar before placing the candle in it. This makes for easy melted wax removal, and the water is a good safety measure. When the candle burns to the bottom of the glass jar there is always a possibility the jar will break from heat buildup. Also, it's not a bad idea to place a bit of water in the bottom, even if it's a Tea Candle because they float well. Stay safe! Always make sure you keep your candle away from anything flammable and don't leave a lit candle unattended. Way to go. Recycled too!. The added water is a great tip. This works and looks great! Love the added safety tip about using water on the bottom of jar and makes wax clean up so easy! We use 3 of them on our patio. Thank you! Good show, now lets see what else you can come up with. Yep, we are using your lil ole invention to save energy on our deck and to keep the skeeters away as well. I used some watered down Elmer's glue and glued tissue paper to the outside of the jar. Then put a thin coat of the glue all over the jar. Voila, you have a stained glass effect.